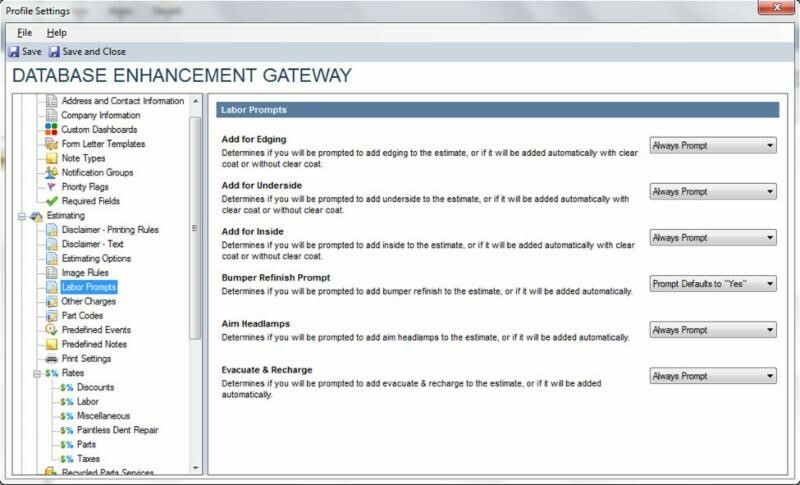 The Database Enhancement Gateway, which allows repairers to make inquiries and suggestions of the Big 3 estimating providers, has been augmented this year to provide weekly tips for repairers on the Audatex, Mitchell and CCC programs. If you haven’t used the service before to answer questions about estimating collision repair work or just browse responses to other shops’ questions, check it out. It’s a valuable resource akin to I-CAR’s Reparability Technical Support Portal, but focused on teaching repairers database best practices instead of those from automakers. Here’s some recent areas spotlighted as tip-worthy by DEG; we’ll be rounding them up periodically for our readers. To receive the tips as soon as DEG releases them, like/follow DEG’s Facebook and Twitter feeds. You can do this when you set a profile default while writing an estimate; it must happen for each profile in your shop. Try this path: Configure, Profiles, Select Your Profile, Labor Prompts. To calculate feather, prime and block in Audatex, you’ll have to define the materials rate for the procedures in each profile’s rate tab. Of course, you’ll still have to factor the feather, prime and block time into the repair time and then divert those hours to that procedure — a point of contention for some repairers. CCC doesn’t include the creation of backing plates or sleeves, but Mitchell and Audatex do so long as you do it from existing stock. The inquiring repairer, in case anyone’s interested, had suggested 2 hours per insert and including material when raw stock was used. “If the sleeve needs to be fabricated from raw stock, the time to fabricate the sleeve is not included,” Audatex wrote. Drilling to install a backup sensor isn’t included in Audatex; you’ll need to input it manually. The repairer had also unsuccessfully suggested Audatex make it part of the damage entry on rear bumper covers. None of the estimating services include resetting electrical components. Questions had been submitted to Audatex, CCC and Mitchell about a 2013 Toyota RAV4, a 2011 Mercedes E550 and a 2009 Toyota Tundra, respectively. “Air bag lights, initializing of a power window, and steering angle sensors are just a few examples of items that require a manual line for the labor amount needed,” DEG wrote.